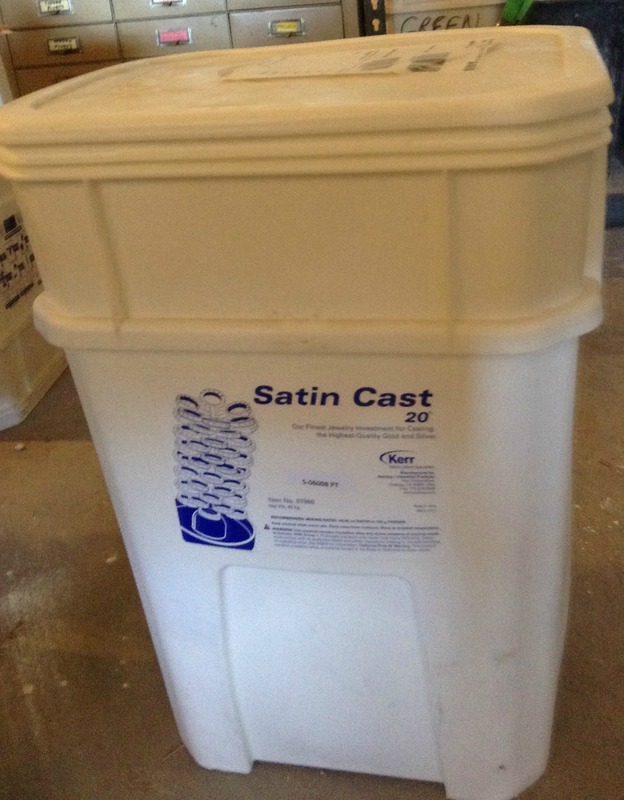 Last time we discussed the basic processes for creating waxes for casting. And then we asked: So now that we have waxes, what next? We turn the waxes into a mold. The waxes are “glued” to special rubber bases using melted wax. The process is called sprueing. 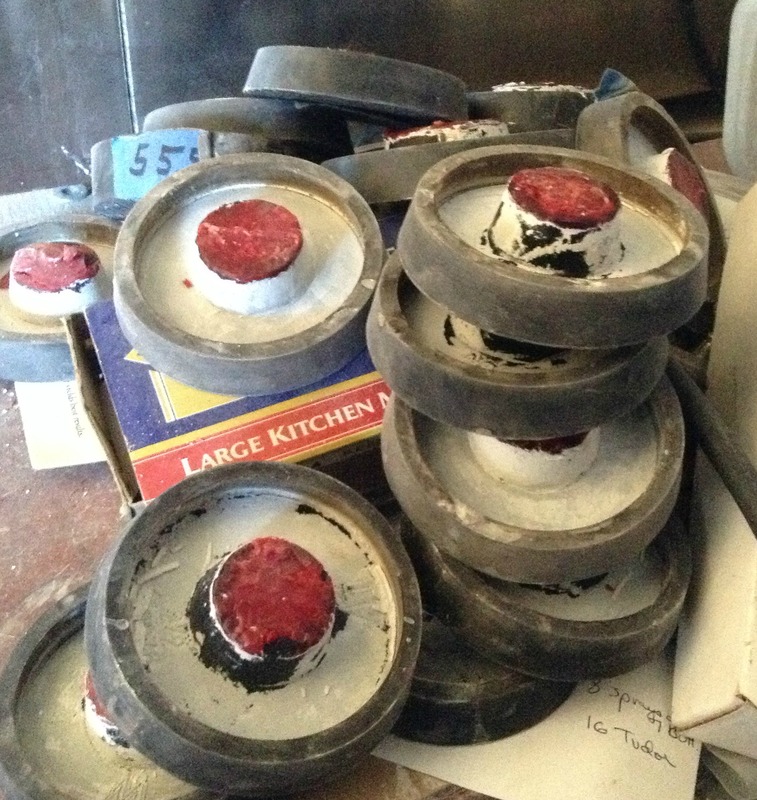 Here is a picture of the rubber bases, just after they are done being used. The red area in the center of the bases is wax and the white substance on the bases is investment (we’ll talk about that latter). You can see a number taped to the side of one of the bases in the back of the pile – that is the weight of the base when it is clean (in grams) and has no wax or investment on it. These bases, with the waxes in place, are slid onto the bottom of stainless steel flasks, which are basically just large sections of stainless steel pipe. 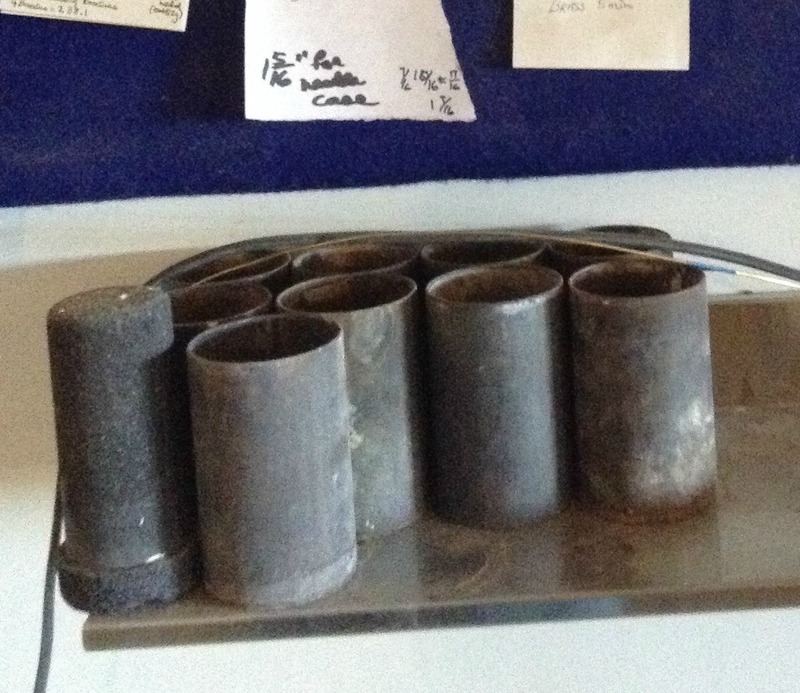 Here is a picture of some of the flasks waiting on their shelf to be used. The blue board on the wall is a production board with all sorts of production details for a variety of projects. The strange looking black thing on the left side of the shelf is an old graphite crucible (it is upside down). 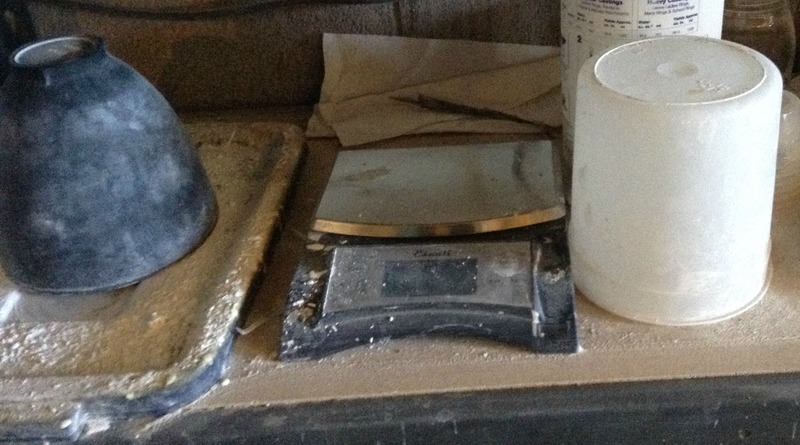 I sometimes use it to measure the scrap metal that I am going to re-melt in my small melting furnace to make sure it will fit in. Once the base is on the flask it forms a container for the investment. Investment is just a high temperature material, containing silicon, that looks like Plaster of Paris. It is mixed with water in precise quantities to form a slurry. This is how I buy my investment, in 100 pound plastic boxes. Here is my messy bench, just after weighing the investment. No matter how careful you are this stuff gets everywhere, just like flour. Because the investment contains silicon, which is bad for you if it is inhaled, it is important to wear a good quality dust mask. The upside down rubber bowl on the left is used for mixing the investment with water. Once a lump-free slurry has been created it is placed in a vacuum chamber to remove air bubbles. The square plate on the top of this vacuum machine has a rubber mat that creates a good seal for the plastic dome that you can see on the left hand side of the machine. It allows the user to create a vacuum chamber that removes excess air that has been trapped in the liquid investment during mixing. Bubbles weaken the structure of the investment and also create lumps on the outside of the cast piece. Once the investment has been vacuumed it is allowed to harden, the bases are removed, and the flasks are ready to be turned into molds. 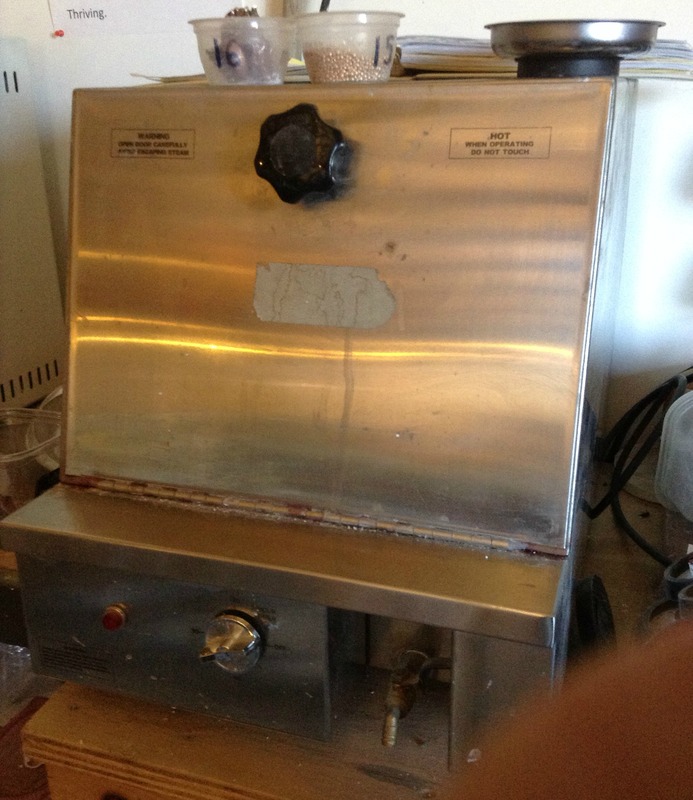 The stainless steel flasks are placed into a de-waxer, a machine which heats the flasks using steam and allows most of the wax to melt out of the flask. 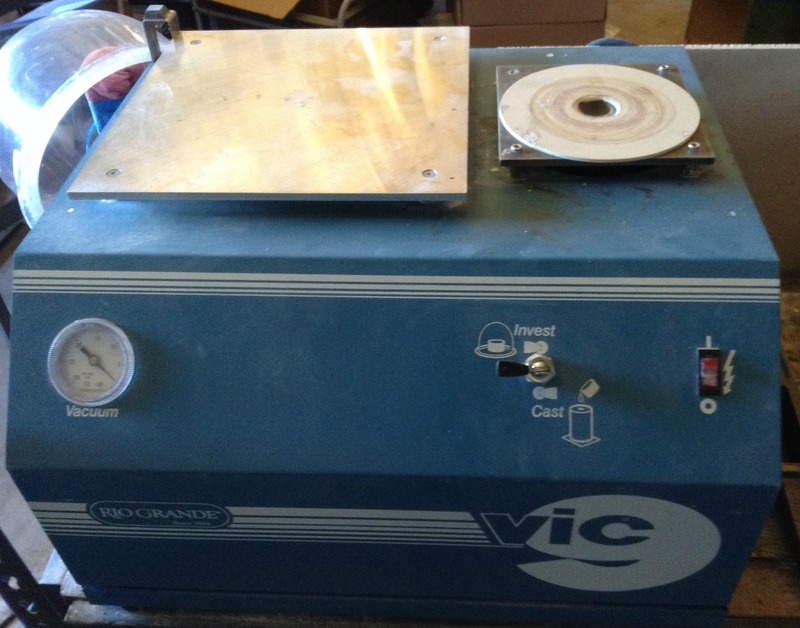 Here is a picture of my de-waxer. This step is where the process gets its name from – Lost Wax. Removing the wax creates a cavity in the investment that is shaped exactly like the original wax. What Next: Heat, Heat, and More Heat! This entry was posted in Metal Casting and tagged bronze frame purse, Lost Wax Casting, Metal casting, silver casting by Eirny. Bookmark the permalink.